European theatre has been the site of enormous change and struggle since 1960. There have been radical shifts in the nature and understanding of performance, fuelled by increasing cross-cultural and international influence. Theatre has had to fight for its very existence, adapting its methods of operation to survive. 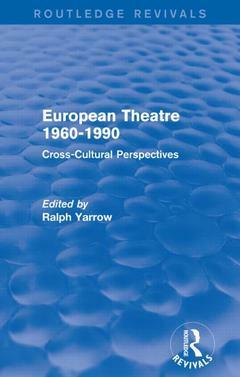 European Theatre 1960-1990, first published in 1992, tells that story. The contributors - who in many cases have been theatre practitioners as well as critics - provide a wealth of fascinating information, covering Germany, France, Poland, Italy, Spain and Sweden, as well as Britain. The book offers an historical and descriptive overview of developments across national boundaries, enabling the reader to compare and contrast acting and directing styles, administrative strategies and the relationship between ideology and achievement. Chapters trace the evolution of theatre in all its aspects, including such elements as the end of censorship in many countries, the upsurge in political and personal awareness of the 1960s, shifting patterns of state artistic policy, and the effects on companies, directors, performers and audiences. This book should be of interest to undergraduates, postgraduates and academics of theatre studies.